It is a myth that the best elliptical machines are expensive. In fact, there are high-quality machines for under $300. There are reasons to purchase an elliptical machine over a treadmill. Treadmills are, in most cases, more expensive to make because of the different motors, weight, and size of them. Ellipticals are lightweight and require one simple motor. 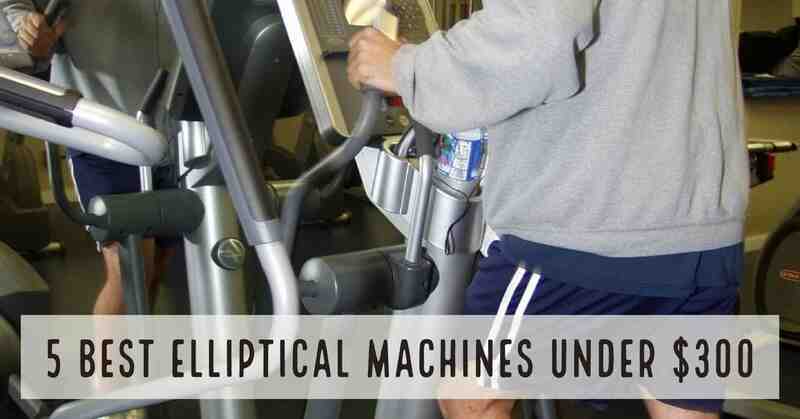 Ellipticals do not create an impact on the knees or joints. For runners, having an elliptical at home is ideal for inclement weather or to keep up with cardiovascular health on a busy day. 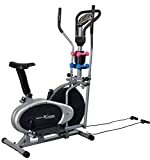 There are a variety of elliptical machines for under $300. Each machine has its own unique feature that makes that machine stand out from the others. Regardless, there is an inexpensive elliptical machine that can meet one’s needs. 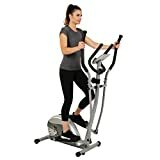 The EFITMENT Compact Magnetic Elliptical Trainer is belt driven in order to provide a smooth, no impact workout for both the upper and lower body. This machine is ideal for someone who wants the benefits of running plus an added upper body component. The belt drive and flywheel are set it, so it is quiet and requires minimal maintenance. A steady heart rate can be achieved and monitored using the hand pulse sensors located on the stationary bars. One of the reasons why this machine is versatile for everyone is it has 8 levels of magnetic resistance. Adjusting the resistance helps an individual reach his or her fitness goals. In order to reach fitness goals, the LCD screen displays time, speed, level of resistance, calories burned, and pulse rate. The foot plates have oversize frames and have non-slip footpads, so it can accommodate all sizes and maintain grip. There is wheel attached to the bottom of the machine, which makes it easy to move and store. It features a small footprint design in order to fit in small spaces. The slim design makes it a breeze to carry, which gives peace of mind to muscle strains. The maximum weight is 220 lbs, and the average price is $200. Upper body grips: allow for a full body workout and imitate cross-country skiing or intense uphill hike. LCD Monitor: displays time, calories burned, distance, and heart rate. 12 preset workout apps: these workouts are developed trainers in order to find a workout that matches fitness level. Cordless: makes it easy to move the machine. 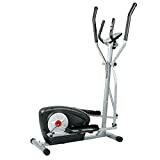 With the Body Champ BR1895 Magnetic Elliptical Trainer, a home workout is easy to integrate. Intensity levels can be adjusted and customized due to the Magnetic Adjustable Resistance built into the machine. Advanced built-in technology allows the user to pick from 16 different resistance levels or any of the 16 preset workouts. It also features an LCD screen, integrated handlebar system that tracks heart rate, and a workout DVD. Ergonomic handlebars: the machine comes with two sets of handlebars. The handlebars are built for comfort and option enhancement. Bi-Directional foot pedals: These pedals are constructed with a step-through design, which makes entering and exiting the machine easy. Media shelf for phone, book, or tablet. Transport wheels: It makes the machine convenient, easy to move, and store. Supplies 2-3 pound dumbbells and resistance bands for added strength training workouts. Also includes easy-dial tension adjustment to suit your own workout goals. High-momentum fan blades produce a gentle breeze as you exercise! The Stamina In-Motion Elliptical Trainer makes getting a workout in a busy schedule easy. This trainer is lightweight and convenient. It can be used standing or sitting. A workout can happen while sitting at a desk! There are various benefits to this simple machine. ​The sitting and standing positions targets different areas. The standing position allows the individual to engage the core and balance in order to strengthen the area. The sitting position exercises the legs. In addition, the forward and reverse motion focus on different muscles in the legs. The elliptical trainer comes with textured pedals, which allows for fast pedaling without the feet slipping. The trainer comes in three color options in order for people to express themselves vibrantly. These are the top 5 machines that are under $300. Each machine features its own unique feature that makes it easy for an individual or family to find the perfect one. Elliptical machines are more convenient that treadmills due to its compact nature and easy mobility.